Your trip to the Lowcountry isn’t complete without experiencing some of the incredible dining options in the area. From local farm-to-table bistros and open-air seafood joints to waterfront grills and delicious brunch spots, you won’t be short on ways to delight your taste buds while in town. Continue reading to discover the best Isle of Palms restaurants! Along with outstanding Isle of Palms restaurants, there is so much activity packed in the area. From wonderful shopping to fabulous bars, it can be overwhelming trying to narrow down which places and attractions to include on your vacation itinerary! To help make your planning easier, access our free Vacation Guide. This carefully curated guide provides expert tips and local recommendations on things to do in the Isle of Palms. Get your copy today! Tucked away in a small strip mall, Long Island Cafe is a hidden gem that’s been serving locals and visitors delectable cuisine for over 30 years. The quaint, family-owned bistro offers a menu full of fabulous French and Lowcountry-inspired dishes such as Shrimp and Grits and local handmade pasta. The Long Island Cafe is open for brunch, lunch, and dinner, and reservations are highly recommended. For some of the area’s best seafood and panoramic water views, head to Morgan Creek Grill. Located at the Isle of Palms Marina on the Intracoastal Waterway, Morgan Creek Grill is the perfect spot for relaxed, waterfront dining. Enjoy an upscale meal in the main dining room or a casual, open-air experience on the rooftop deck and creekside bar. Morgan Creek Grill also offers live music every Friday and Saturday night! Acme Lowcountry Kitchen is a no-frills beach joint serving breakfast, brunch, and dinner. Although the atmosphere is casual, the menu is world-class and locally sourced, using the freshest ingredients. With a daily happy hour from 3 p.m. to 6 p.m., Acme Lowcountry Kitchen also provides a great spot to grab a drink or two. The Refuge is a bright, modern eatery offering fabulous coffee, breakfast pastries, and sandwiches during the day and signature drinks and southern fare at night. Brunch enthusiasts will delight in the weekend menu featuring delicious creations such as baked avocado and egg and stuffed french toast. Visit the Refuge website or social media pages to find out about upcoming events and weekly live music! You can’t go wrong with any of the fabulous menu offerings at The Boathouse on Breach Inlet. The vintage sailboats that adorn the ceilings and other cozy coastal decorations provide the perfect setting for enjoying daily fresh fish prepared exactly how you like it. You’ll also find fabulous appetizers, soups, salads, filets, and a full raw bar. One glance at the menu and you’ll quickly understand why The Boathouse was chosen as the 2018 Diners’ Choice Award winner! If you’re searching for where to stay on the Isle of Palms, look no further than East Islands Rentals. 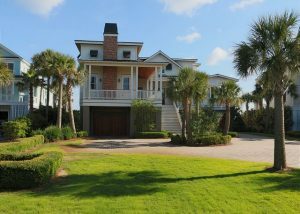 Our vacation rentals provide convenient access to all the best Isle of Palms restaurants, activities, and attractions! For a wonderful getaway in a beautiful oceanfront beach house, take a look at Lady Poseidon. This fabulous 18-person home features 6 bedrooms, 5.5 bathrooms, and a private pool! With a luxurious master suite, stunning ocean views, a full wet bar, and a private heatable spa, you’ll find endless ways to indulge during your vacation. Browse all of our accommodations now and book the perfect vacation rental today! We look forward to hosting you on the ultimate Isle of Palms vacation.